If you thought with all these companies producing gelato that the Greek yogurt fad would be over, you'd be sadly mistaken. 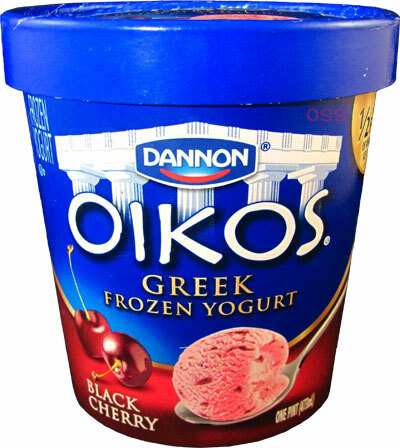 Not only will we be seeing a Greek version of Ben & Jerry's Cherry Garcia but Dannon has also decided to produce their own pints under the Oikos line. First, don't ask me why there aren't any commercials of John Stamos promoting these (Update: there are now!). Second, yes there already is an Oikos line of frozen Greek yogurt made by their sister brand Stonyfield. The major difference here is that those are organic and fat free, while these are not. Also, the flavors Dannon offers are more enticing. Since I didn't want to go the basic route (like Strawberry), I grabbed their Key Lime and Black Cherry flavors. Both of these flavors don't get much love in the ice cream isle so I'm happy Dannon is showing them some respect. 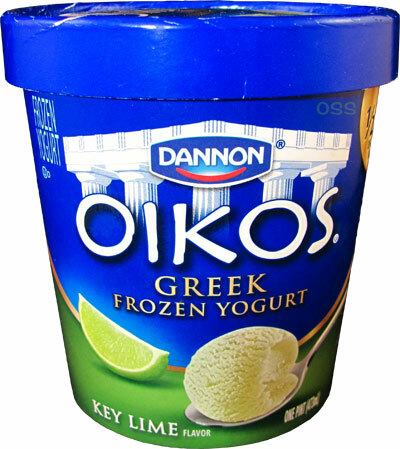 Dannon OIKOS Key Lime Flavor Greek Frozen Yogurt. Lime products are hit and miss on the blog. It's one of those flavors that has a fine line between being terrible or amazing. Well that's a surprise. Is it me or does that resemble the color of an avocado and not so much a lime? I was expecting something bright or at least vibrant. Either way, I'm ready to dig in.? Hmm, the texture is definitely an improvement compared to most Greek frozen yogurts. It's thick but obviously you can tell it's not ice cream. The flavor matches the color because it's pretty tame. I was bracing myself for something very tart because of its make up but there isn't any tartness at all. 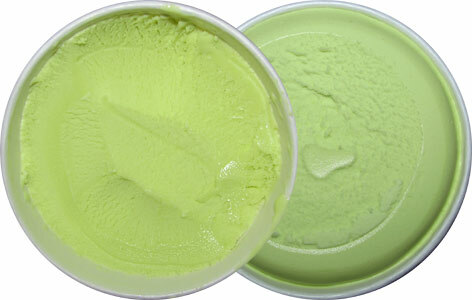 What you get is a pleasantly creamy lime flavor. It's a refreshing take and even though I originally wanted some tartness, this doesn't really need it. It's a lot more enjoyable without that added citrusy bite. All in all, this is a solid start for Dannon. On to the next! Once again, the color is not what I was expecting. I was expecting a deeper red but as you can see, this is more on the pinker side of the spectrum. 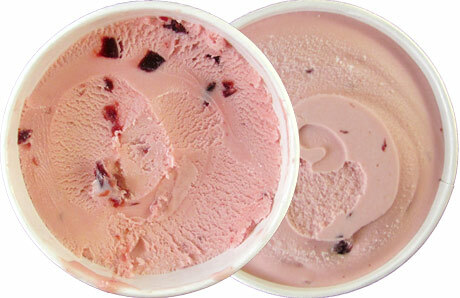 The texture is just like the lime except you get chunks of black cherries to change up the texture ever now and again. Continuing the theme, the flavor is like the lime in the fact that it’s very tame. This isn't going to beat you over the head with cherry flavor. Instead it’s going to be a mild flavor that is meant to be savored. This line seems to be more able giving the consumer a refreshing product rather than blowing their taste buds away and I can definitely appreciate it. With nothing artificial going on either, these make for a perfect treat to just scoop some into a bowl and relax. To that I have to say good job to Dannon. 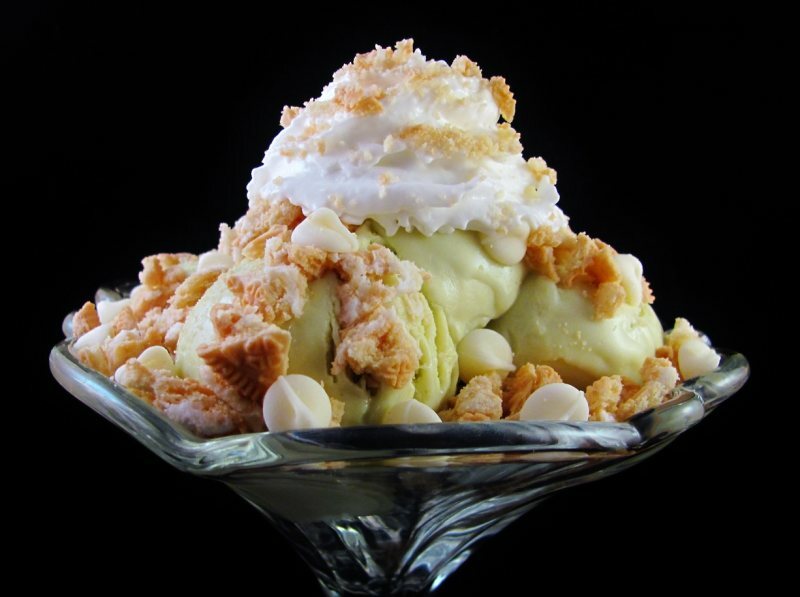 With a frozen dessert market filled with sensory overload, these really let you comfortably appreciate your treat. 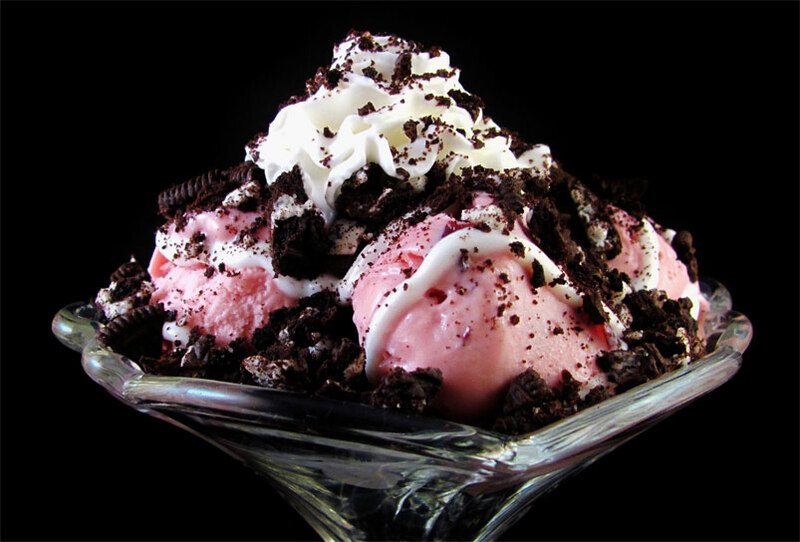 On Second Scoop: With such mild bases, I knew these flavors would be perfect for sundaes. I've been on an Oreo kick lately so I give to you: White Chocolate Key Lime Cookies & Cream and Black Cherry Cookies & Cream. Let’s just say I was right and these were some pretty delicious sundaes! When it comes to fruit flavored frozen desserts I actually prefer the taste to be tame because I am not a big fruit lover, so I'd probably enjoy these, too. However, I could never see myself buying these because although they contain more protein than ice cream, they are calorically the same as ice cream, and if I'm going to splurge, I'd rather indulge in something other than Greek Frozen Yogurt. I'll still stick with Stonyfield's when I want a healthier treat even though I'd be interested in seeing how the Dannon Oikos Café Late Greek Frozen Yogurt compares to Stonyfield's. Stride, I'll eventually get around to trying the cafe latte. Of you try it, be sure to let me know your thoughts! Josh, coffee froyo if way better than coffee yogurt. I've tried dannons normal coffee yogurt and was not a fan but for the most part, coffee froyos have the same taste as what you'd get from a coffee ice cream. I think the colors are pretty normal because there are no additives. Really, any lime flavored thing should be white. I have tried all the flavors and my favorite are the cafe latte, then the lime and chocolate. I found the strawberry and cherry flavors a bit more drab. I honestly couldn't tell a huge difference between them and ice cream until it melted and then I was just eating yogurt haha! Nick, I took up your challenge and finally tried the Dannon Oikos Café Late Greek Froyo. Here is my review. In my opinion, coffee frozen desserts fall into two flavors: 1)Mild in coffee flavor, with more milk/cream, and sweet. 2)Robust in coffee flavor with less cream and sweetness. This one falls into the category of light in coffee flavor and very sweet. The color is a very pale tan color, akin to Haagen Dazs' Cappuccino Gelato and the ingredients indicate that less than 2% of coffee extract was used, so before digging in, I had a feeling I was going to have a mellow coffee flavor. And I was right. Up to this point, my favorite coffee frozen desserts have been Stonyfield's Gotta Have Java and Haagen Dazs' Cappuccino Gelato but this may have dethroned both of them, as I pronounce Dannon Oikos Café Late as one of the best coffee frozen desserts I have ever tried. If your a fan of B&J's CCBBB and prefer dark coffee frozen desserts, then this is not for you, but if you are like me and like a very sweet frozen dessert with tones of coffee flavor then this is your cup of Joe (no pun intended). It is one of the sweetest frozen desserts I have ever had, even sweeter than Gotta Have Java, so this one needs to be eaten slowly to savor every bite. I love my desserts intensely sweet but this was almost too sweet for me. In fact, it is almost as sweet as a milkshake. So, one pint was enough to satisfy me, whereas I can easily consume two pints of Stonyfield or Haagen Dazs' Cappuccino Gelato if I did not restrain myself. For others, especially those who like dark coffee, one or two servings will be enough. The color of the dessert is a very pale tan color that reminded me a lot of Haagen Dazs' Cappuccino Gelato color. The texture is silky, smooth, and creamy with no tang that usually comes with frozen yogurt, so this could easily be mistaken for ice cream. So comparing this to Gotta Have Java, this one is less robust in coffee flavor, sweeter with more milk/cream being used with hints of coffee flavor. But don't be fooled because on the first scoop you will still get be greeted with the usual bitterness that comes with the territory of most coffee flavored frozen desserts. But that bitterness quickly fades into a delicious milky sweetness with hints of coffee in the background as you continue to dig your way through. Having said that, I do not think you will like this one, Nick, since you like dark coffee flavors. I can see you preferring chocolate cookies, chocolate coated espresso beans, or dark chocolate chips in this one to balance out the sweetness. Now that I have given you my review, I am eager for you to review this in the near future because we both have different preferences. Stride, you out did yourself on that one. Now I feel obligated to pick that flavor up to review sooner than later! Nick, I just tried the chocolate flavor and wanted to give you a quick review since no one has reviewed it yet. The Dannon Oikos Chocolate Greek Froyo tastes exactly like Stonyfield's Oikos Nonfat Frozen Yogurt, which have disappeared from the shelves in my area, so I think it may have been discontinued. Like the Stonyfield version, it started with that strange and funky aftertaste, which I am guessing comes from the Greek Yogurt, but the more I ate through it, the more I adjusted to it. The base is a milk chocolate base, as it is sweet without any bitterness. So, unlike the Café Late which tasted like ice cream and had no tangy flavor, the chocolate flavor lets you know that this is a Greek Frozen Yogurt right off the bat. As it melts, the sweeter it tastes and that's how I preferred consuming it - mostly melted - as it tastes like a very sweet chocolate shake that way. It satisfies the chocolate craving for those who want a healthier alternative to ice cream. With 28 grams of protein per pint, it justifies eating chocolate for any meal - breakfast, lunch, or dinner. Now, it's your turn or Dubba's turn to try this and write a review so we can compare and contrast our opinions! I discovered your Mint chocolate chip and I'm addicted. The chips are small shaved chips and the mint is delicate. It tastes like cream. It has the perfect balance of mint and chocolate. The best I've had. I never understand comments like this because they stopped making frozen Oikos. Are you referring to their regular yogurt? or you found some really old stock of it? or you miss it?